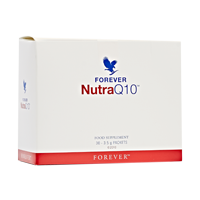 Forever NutraQ10 contains Q10 plus essential vitamins, including C and B6 which contribute to the reduction of tiredness and fatigue. Suggested use: one packet per day. N.B. Consult your doctor if you are on medication. Avoid if pregnant, breastfeeding or suffering from kidney disease. This product contains soy. Mix 1 packet per day thoroughly with Forever Aloe Vera Gel, water or other beverage. Fructose, magnesium carbonate, emulsifier (soy lecithin), ascorbic acid (vitamin c), coenzyme Q10, bulking agent (microcrystalline cellulose), anti-caking agent (silicon dioxide), olive leaf extract (olea europaea, maltodextrin), turmeric extract (curcuma longa), grape seed extract (vitis vinifera), boswellia extract (boswellia serrata), d-alpha tocopherol (vitamin E), chromium chloride, pyridoxine hydrochloride (vitamin B6), folic acid (vitamin B9), cyanocobalamin (vitamin B12, dicalcium phosphate). Allergy advice: see ingredients in bold.